There, around a pile of hot, white coals were two or three whole pieces of beef rib, rested up on metal stands and cooking slowly in the heat. Impressed and made hungrier by this culinary kerbside theatre, we strolled in and took our seats. 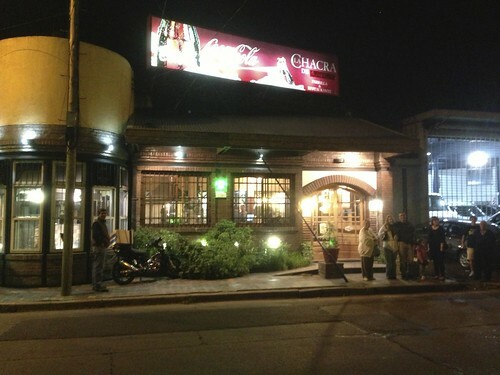 La Chacra de Andres is a large restaurant, situated in the town of Haedo, about an hour's drive or so from the centre of Buenos Aires. We arrived around 9pm and many of the tables were empty. Maybe we were a touch too early, the usual time for the evening meal being between 9pm-10pm. There was a couple nibbling the last of their meal and a family of three seated near us. The atmosphere was casual. You smell sweet, burning coals from the meat cooking at the front of the restaurant while a television screen buzzes and flickers on the wall at the back. 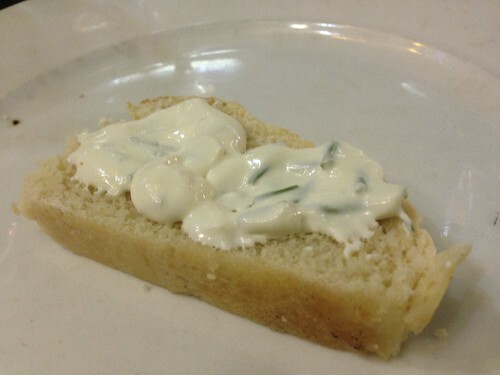 We sat down, twelve of us, and were brought drinks (juice, water and wine) and sliced bread with little bowls of cream cheese and chives. After we'd polished off our appetiser, the meat was quickly brought, and placed on the table on little table-top grills that keep the meat warm with coals while you eat. 'You've got to be quick,' my husband said to me, while forks appeared from all directions jabbing at different pieces of lightly charred meats. Casting my British politeness to one side, I dived in with my fork, too. 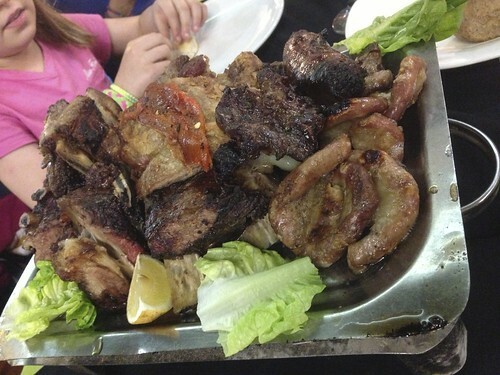 Selection of parilla meats: molleja, kidneys, chinculin - the entraña can be seen on the top right of the photo. 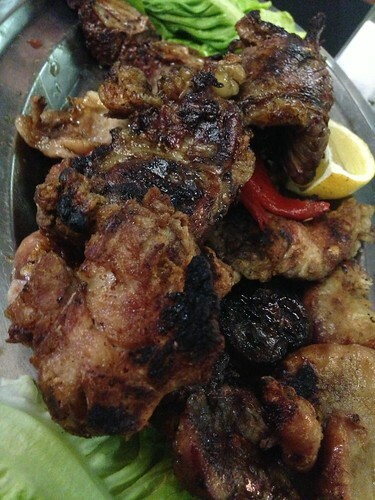 There were bony chunks of ribs (costillas), kidneys (riñones), glands (molleja) and grilled intestines (chinchulin). The ribs were luscious; sweet and charred, while the meat within was tender and blushing pink. Many of my family members had gone dewy-eyed at the thought of molleja, but I found it too soft, with a creamy texture and a sweet flavour. Maybe it was just because I wasn't used to it. The chinchulin was slightly bitter inside and a lot like eating an empty sausage - chewy and crisp in places. Entraña is a cut of meat from the belly of the cow, and that was curled around the serving dish too. I cut myself a piece and found it full of flavour - a cut that we could do with eating more in the UK, where I think we stick to the regular cuts of meat far too much. We ate all this sharing a couple of plates of salad and some skinny chips. The twelve of us ate until we were really full for 900 pesos, the equivalent of about £120. And we took home a lot of the meat for the fridge for picking over the next day. As with anything, you get parillas that aren't so good, and others that the locals regularly go to. We were told this was a good one. And you get to park your car on the forecourt too, if you give the man a little tip before leaving. You'll see parillas on many streets around Buenos Aires - some people even set up grills on the side of the road and sell chorizos or panchos (hot dogs) to passers-by, advertising their wares by a makeshift cardboard sign and the wafting smell of charcoal. 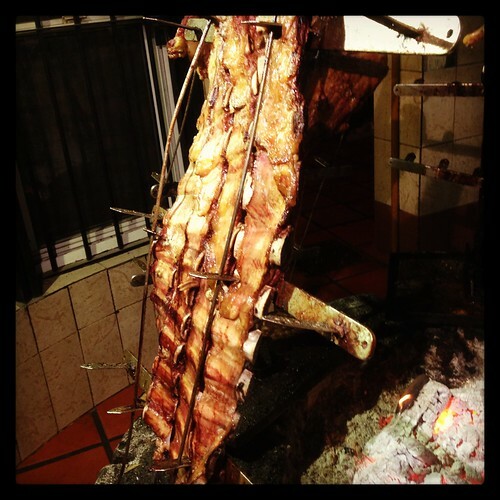 Argentinians know how to cook meat, and they know how to make the most of an animal too, using up every part of it. My advice? If you find yourself in Argentina, you have to try parilla. Just don't be squeamish, no one else will be.